Atomic 212 is a creative service media agency offering a full range of services across all media, strategy, digital, data, creative and content marketing for both online and offline businesses. 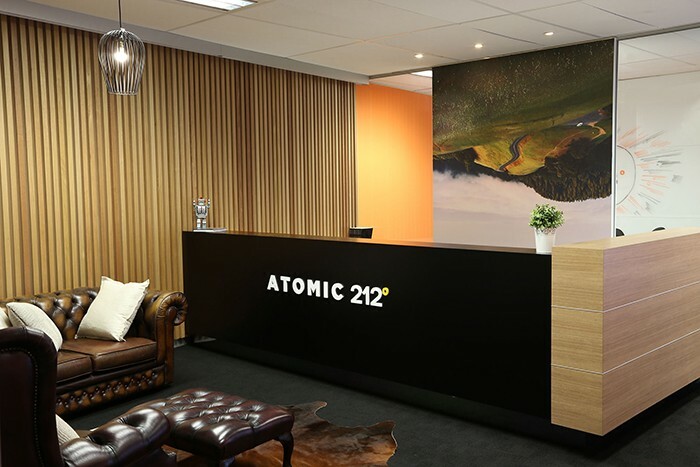 Atomic 212 currently has offices based in Sydney, Melbourne, Newcastle and Auckland. ODC Design was appointed by Atomic 212 to refurbish their Melbourne office to accommodate the company’s recent growth in Melbourne and reflect their new branding. Taking on board Atomics 212’s individuality and company values to “Think Differently”, the space was created with quirky undertones. Our client supplied their own images depicting free thinking creativity that were used for the wall graphics in the boardroom and reception area, and are consistent with their head office in Sydney. In addition to the graphics, an artist was hired to characteristically illustrate a pitch for one of their major accounts using the full length of the boardroom wall. Atomics 212’s existing furniture provides for an eccentric look and feel, and compliments the overall unconventional design layout.